This will not be the last post in which I praise the Leica M8 I’m afraid. There is something about the files that keeps me grabbing the now 10 year old M8. I recently read an article by Thorsten Overgaard where he confesses a return to his M9, letting the ‘better’ Typ M240 collecting dust. There is something about the CCD sensor that sets the M8 and M9 apart to all other camera’s, in my opinion that’s to say.There has been enough written about this (and fiercely discussed), so I won’t go into this any further :-). Having said that, one of the qualities the M8 is praised for, is its black and white conversion, which this picture is a fine example of (see my pictures here and more to follow in future posts). 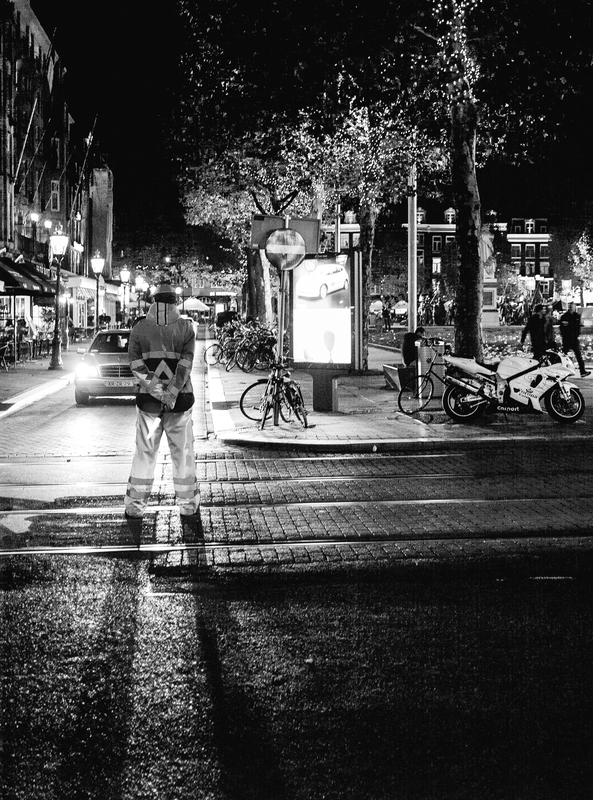 I shot this picture after visiting the Starbucks at the Rembrand Plein, Amsterdam. I noticed the man directing the traffic and took the shot at a high ISO (eeeek!). Although the bright yellow light he was holding in his hand did me grab my camera, in post production a black and white conversion yielded the best results.